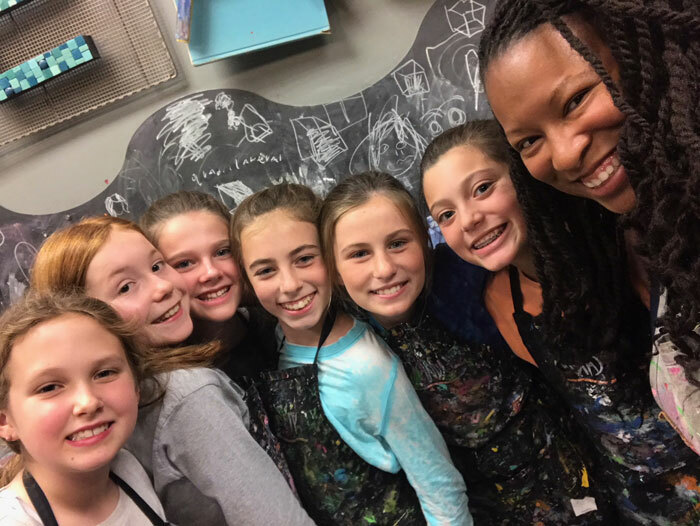 I just love the energy in the open studio and classroom this time of year. 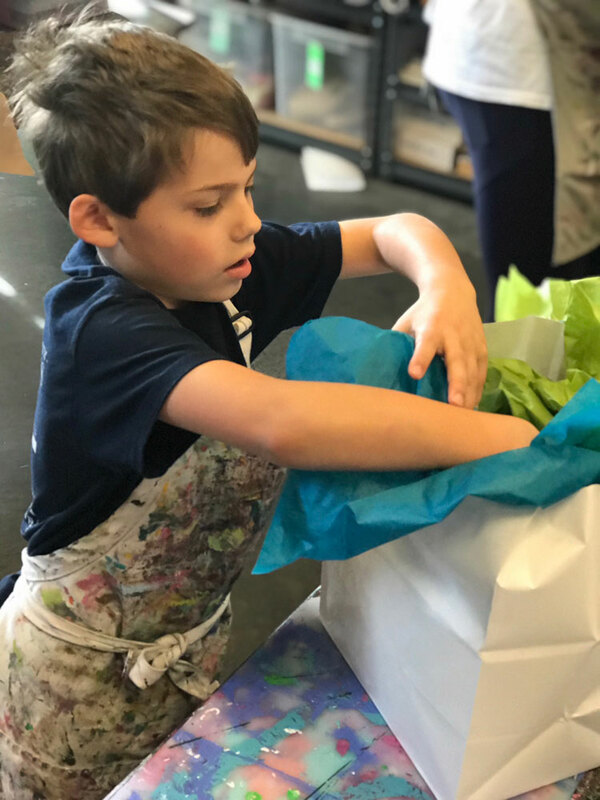 Yeah, it’s busy, but it’s a great kind of busy–kids & adults all creating something, concentrating, laughing, and sharing their ideas & reasons for their gift-making. There are so many NEW projects in the open-studio. 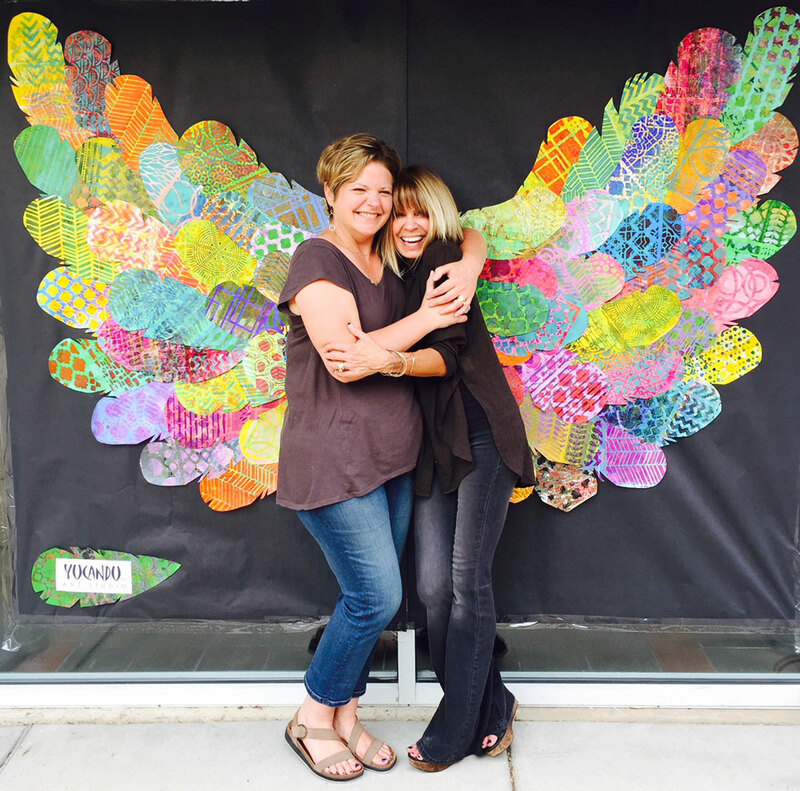 Mosaics, decoupage, and painted projects. 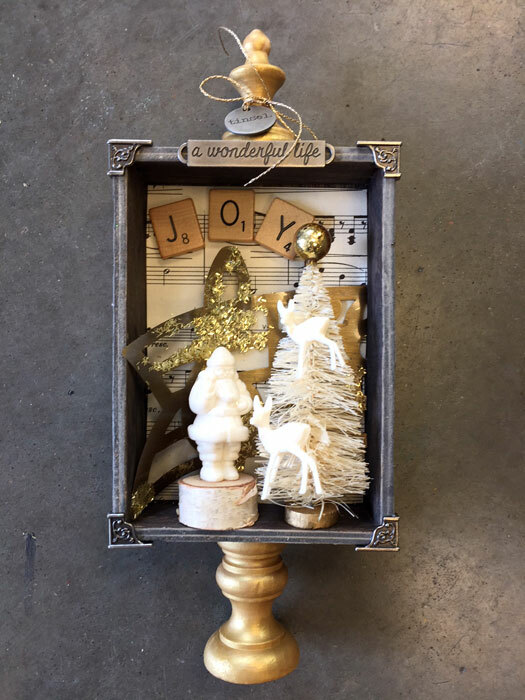 Plaques, Christmas trees, reindeer, angels and so much more…Come check them out. During the holiday break, we will be open early at 9am. And don’t forget about our half price studio fee times, Thursdays, Fridays and Saturdays from 6 to 8pm (but we are open til 9pm those evenings.) 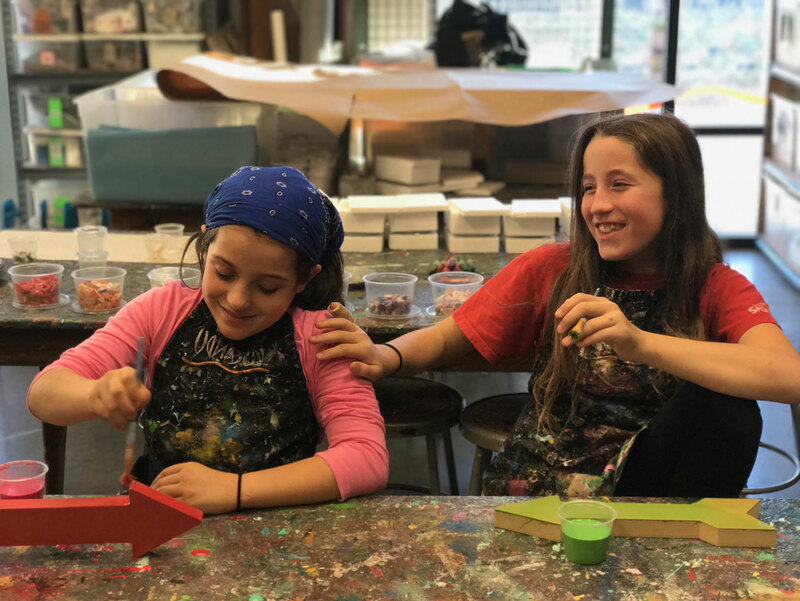 We also offer a half price studio fee card, which is perfect for our regular art and craft makers and for families as well. It’s a 25 hours studio punch card for only $50–super simple to share with your friends and guests too. This is a Tim Holtz Vignette Box with all the Christmas craft trimmings. Holly and I worked on this sample together. We went with neutral color palette, but there are so many options here for brights as well. We have it all here for you–paint, papers, adhesives and fun artsy additions. 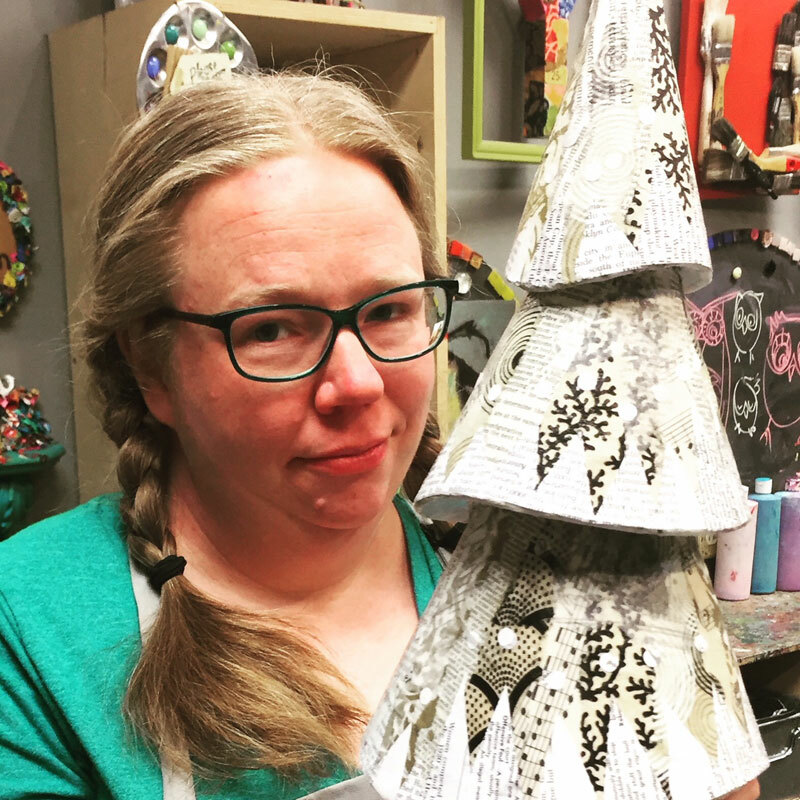 In addition to the open-studio, there are plenty of other ways to get creative this holiday season. 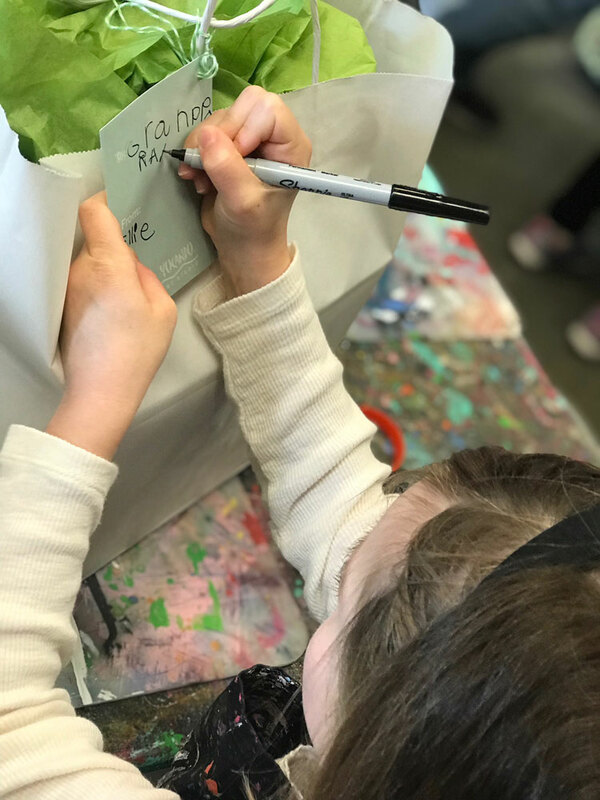 Webster’s Cookie Walk this Saturday, an Adult Photo Mosaic Workshop next week, Gift Workshops for Kids, New Years Eve Workshops and a NEW Thank You Note Workshop. A bit of news especially near to my heart…Holly, my business partner since 2003, is retiring at the end of this year–taking time for travel and her growing number of grandchildren. I will truly miss working with her, but because we’re such close friends, I know I will still get to spend time with her and her family -Kim (I’m on the left, Holly on the right) This photo was taken during the Old Webster Art Walk this October. Don’t you just love those wings? Katie made them with our Gelli Mono-Printing and Stencil Girl supplies. So fun! The local shop-owners have made some goodies to share with their patrons. 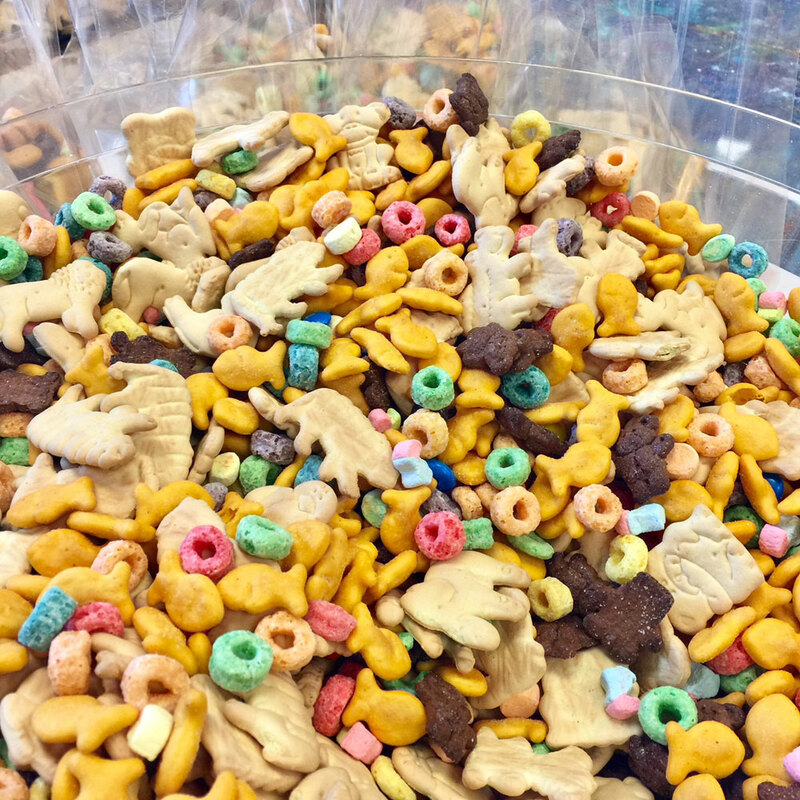 Holly and I made a no-bake treat, sure to please the younger at heART…Party Animal Snack Mix. Perfect timing to show off our new party project. AND kids can vote on the next new party project too. Stop by Sat. Dec 9, 2017, 3-5pm and get a bag. 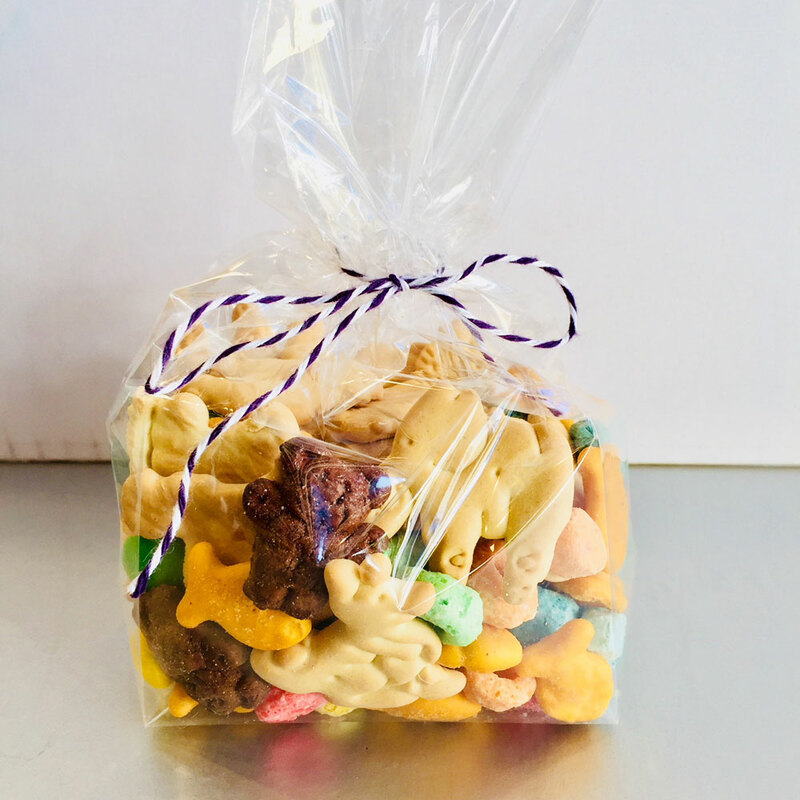 Party Animal Mix Recipe: Animal Crackers, Chocolate Teddy Grahams, Cheddar Gold Fish, Fruit Loops with Marshmallows and M&M’s. YUM. 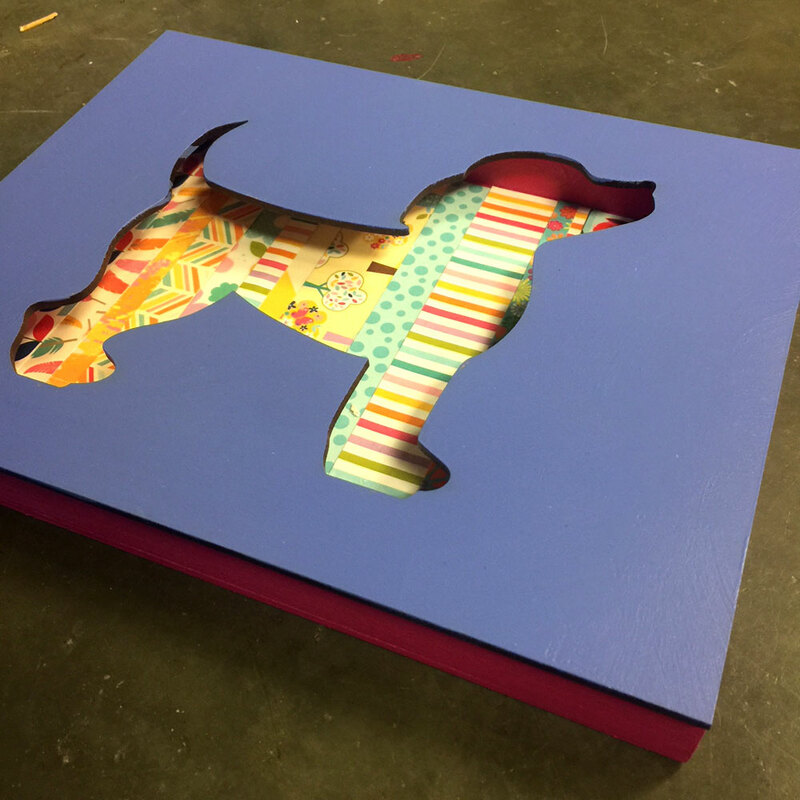 Shadow Box with Puppy Cut Out–fun new birthday party project. Can you think of any other animals we should make for this project besides puppies? We want to know… Here is the link to our private party information for adults as well as kids kindergarten and up. Why are they “top-secret?” It’s been a tradition here for the past 14 years that the gifts they make are a secret. And the kids just LOVE it that way. They take so much pride in truly surprising you with a gift they made by hand, just for you. Some of the sessions are sold out, but it’s not too late to sign up. 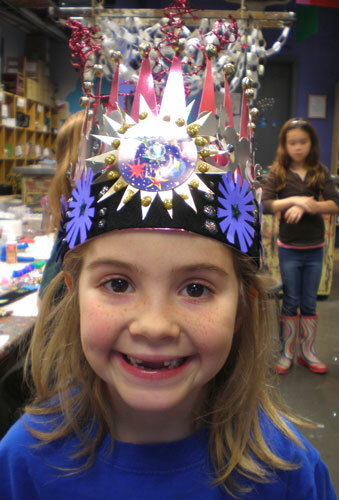 Kids LOVE making these crowns at this annual workshop. It’s a party in itself, BUT they’re so perfect to wear to any and all of your festivities. 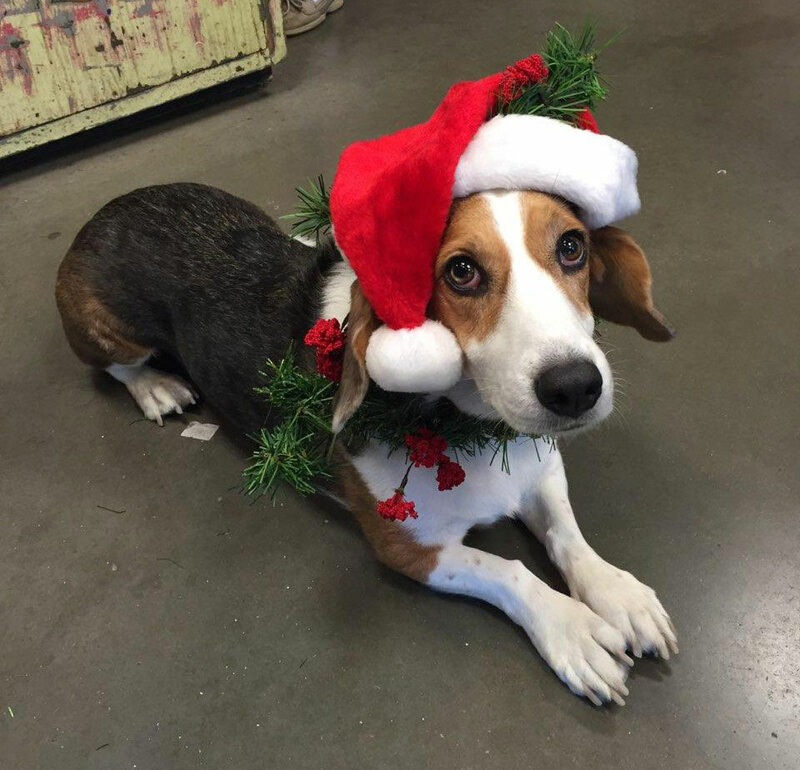 Merry Christmas from all of us at Yucandu, and Canolli, our lovable shop dog too. previous post: After-School Art Club. A great stress reducer.